2018 Summer 5000 Pound Goal Achieved! 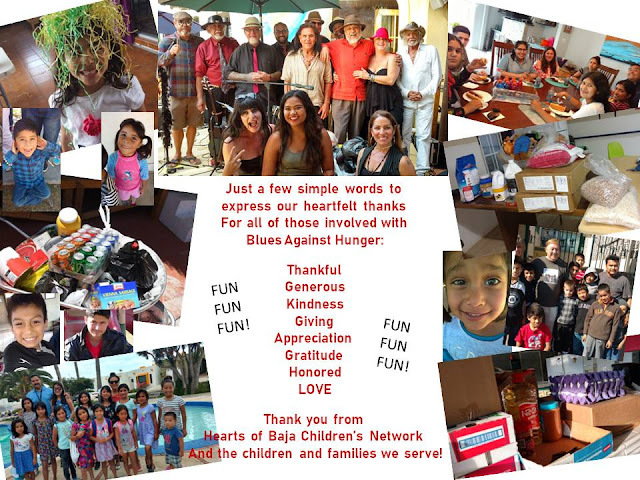 The Blues Against Hunger Society would like to thank Rosarito from the bottom of our hearts for making the Sunday Jamborees such a huge success. We began on May 20 and ended Sept 2 having raised our 4,800 pounds of non-perishable food, 200 pounds short of our 5000 pound goal. On October 7, 2018 we had the grand finale to reach that goal - WE DID - and we surpassed it! Rosarito Blues Against Hunger raised 5400 pounds for Hearts of Baja and the 22+ orphanages they support. THANK YOU. We need to thank Hearts of Baja and ALL THEIR INCREDIBLE volunteers and supporter that get 5400 pounds of food to the people that need it. Thank you to Bobby's by the Sea and Cerveceria Surf and Sushi and their staff for hosting the events. Thank you to the band Wild Pack and to all the amazing musicians that shared their love and passion with us. To all the volunteers and people that gave of themselves to support Blues Against Hunger and it's efforts, and the photographers that captured the moments. THANK YOU / MUCHAS GRACIAS AND WE LOVE YOU! Blues Against Hunger will be back in December with a very special 3 week Christmas Party Concerts. Also, everyone is welcome to join the 5th Annual Baja Blues Against Hunger Tour in January 2019 www.bajablues.com. JOIN US - MUSIC AND MEALS HEAL.